MonkeyContact is the ability for you to find everyone you know, everywhere without the hassles of synchronization or management. 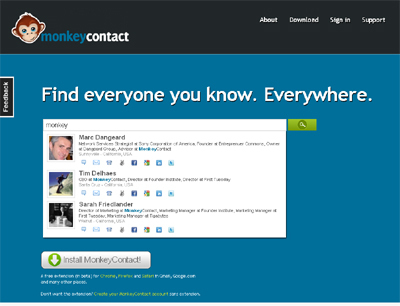 MonkeyContact allows you to find people by name, company, location, job function or a combination. It does not matter what social network you are contacted to them by. MonkeyContact is your personal people search right within Gmail, Google.com search or the web.